Residential catering is provided by KIS Food Services, at 2 main dining facilities with equipped with full kitchens, and Gymkhana Snack Bar, an attractive outdoor fast-food counter. The Food Services team comprises 50 staff, with the expertise to prepare multi-cuisine dishes with vegetarian and non-vegetarian food being prepared in designated kitchen areas. The menu is planned with both variety and nutrition in mind. Special meals can be provided on medical advice. 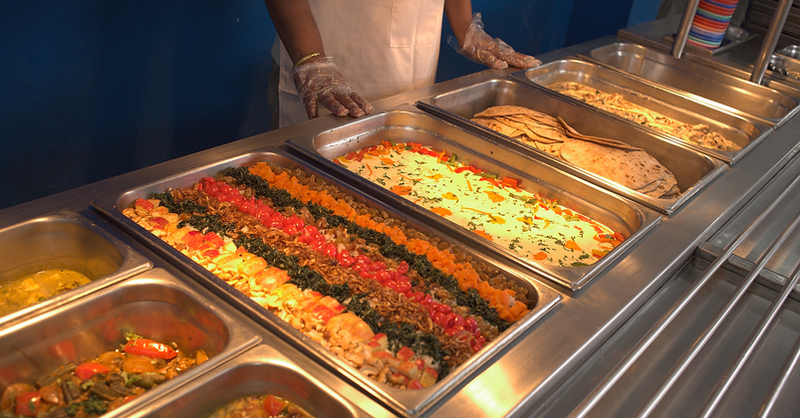 We have a strong Food services team at Kodaikanal International School headed by highly qualified chefs bringing with them their combined international experience of over 40 years. The rest of the team comprises of local cooks who are trained specifically in their areas of Expertise to enhance the Quality of production. Underpinning the functioning of the department is assured by International standards, ranging from hygiene to quality control. The department also strives to encourage local farmer’s produce of organic fruits and vegetables, wherever possible for school procurement. Regular audits spanning procurement, issue, production, service, water purity are periodically done to ensure health, safety and balanced and wholesome food. The cafeteria menus are Tailor made and not Cyclic with diversification as the core. Food from different Countries (Mexican, Arabic, Italian, South East Asian, Korean, Chinese, Thai, Continental, French, American, Bhutanese, and Nepalese) is regularly served, giving the students a flavor from around the world and most importantly from home. The Student Food Committee share the preferences of the community as their suggestions are highly valued and implemented. The department encourages input from parents (dietitians, chefs) not only addressing their concerns but also coming alongside to help them prepare special dishes for occasions (Graduation, Korean Independence Day). The department is also a part of the “world school meal day” which is based in the UK and has schools from all continents who are members. Once a year the event is celebrated all over the world. On this day the department along with SOEX (social Experience) runs programs on healthy eating in the school as well as in other schools. An orphanage is invited for an international lunch to school. The department strives to educate about healthy eating – whole grain, multi grain, fruit and fresh juices, low sugar beverages, pro-biotics, high protein and fiber are high on its list and our menus reflect this. From High Protein breakfasts, fruit for mid morning snacks, to a lunch which is a combination of Indian and International, where a choice of red and white meat is offered to the Non vegetarians and a choice of either Cottage cheese or two other vegetarian dishes is available. Evening teas are a savory and a sweet snack, followed by Dinner which like lunch is similar in its choice followed by dessert accompanied by a hot or cold energy beverage. The Department also operates Gymkhana (The Snack Bar) which is the student hang out area and has a character completely different from the cafeteria. Apart from Ice creams and fruit juices the Gymkhana serves healthy food like Whole Wheat burgers, freshly squeezed fruit juices and smoothies, lassi, Tender Coconut, high energy nut bars and chocolate. The Student Food committee also plays a major role in the Gymkhana’s Menu Designing, Requirements, Feedbacks and Experience.